(Bloomberg) -- A key part of the German yield curve has flattened at the fastest quarterly pace since 2014. In the week after the same pocket of the yield curve for Treasuries inverted -- fueling speculation a recession is on the horizon -- the extra yield on 10-year bunds over three-month bills slipped to within two basis points of the post-crisis low. It has tumbled from 100 basis points at the start of the year to 45 basis points at 5 p.m. London time on Friday. The European Central Bank has little margin to lower rates further, after the infusion of 2.6 trillion euros ($2.9 trillion) into the euro-zone economy through its bond-buying program crushed spreads from Lithuania to Portugal. At the same time it drove yields in Germany and the other most credit-worthy members below zero, in what some call a Japanification of the fixed-income market. For a look at the world of negative debt, please click here. 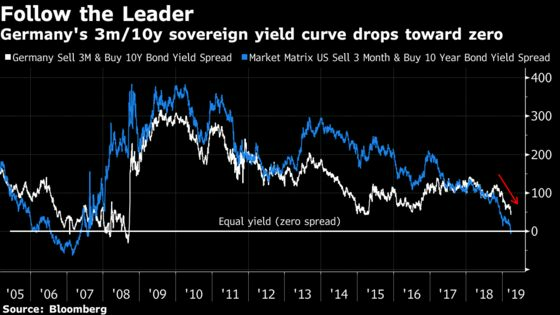 While further flattening of the curve on Europe’s benchmark bond could well take place, strategists reckon it would take an approaching economic depression or worse before it inverts. With the 90-day German yield already so far below zero -- it’s currently at about minus 53 basis points, it would be a massive shock for the 10-year bund yield to dive below that. The phenomenon has happened before, however. The yield curve between three-month and 10-year German debt followed that of Treasuries into negative territory briefly in 2007, and then again a year later as the great financial crisis went full-bloom. The 10-year bund was yielding minus seven basis points on Friday. Its counterpart in Switzerland yielded minus 38 basis points.